“If, as we are led to believe that George Michael was caught with class A and B drugs on him, then he should be prosecuted, after all it isn’t the first time. However, the decision not to prosecute George Michael sends the signal to the public that if you are a celebrity in London you come under a different set of laws to everyone else. It also sends a powerful and destructive message to young people who admire George Michael, that drugs are fine, there is no penalty if you take them. After all didn’t the Met let Kate Moss and Amy Winehouse off as well? The Metropolitan Police seem to be making this up as they go along. The Centre for Social Justice's Breakthrough Britain report showed that in Holland and Sweden where they have much clearer and tougher laws, everyone gets treated the same and the result is that there are no mixed messages and they have proportionately far fewer drug abusers than the UK. Over on The Platform, another London Tory MP - Mark Field - sets out his own wider case against the Met. Read it here. IDS is absolutely right to raise the subject and ask some questions! It sends a terrible message if George Michael is not charged. People are "goo goo eyed" enough over celebrities as it is and many kids aspire to nothing more than to be "famous". Now they are being sent the message that not only do celebrities possess a charmed life when it comes to having money and possessions, they also literally have a charmed life when it comes to wrongdoing! Is IDS advocating that we follow Holland's drug policies? 'Coffee shops' in every town?
" Holland and Sweden where they have much clearer and tougher laws, everyone gets treated the same and the result is that there are no mixed messages and they have proportionately far fewer drug abusers than the UK. " I agree, the law should to balanced so that no-one gets convicted for being in possession of drugs for personal usage. Will.B @ 08.08 is deliberately (one presumes) misinterpreting what IDS was saying. The point is that, in these countries the law is clear and is enforced equally and rigorously. That is what the Met are not doing here where 'celebrities' are concerned. What the Law actually says in these countries is another question altogether. Now it may be that there are some in the Met who think the Law should be other than it is and are inclined to 'exercise discretion' on enforcement. We have the example of the Liberal regime of Mr. Paddick in Lambeth, do we not? GBE.com evidently thinks so too, but that is a matter for Parliament, not for policemen. Oh how clever. Let's take DNA off people who drop apple cores, and five year olds who *might* commit a crime when they are older. Let's allow our councils to spy on our underwear drawers to see if we are cheating the system and yes let's let them use measures in place to counter terrorism to spy on our rubbish habits. And in the meantime let's let celebs in possesion of crack off with a warning. Who wants to live in a world like this? IDS is absolutely right. This affair and the interminable cases of Pete Docherty show just how useleess the attitude of the police and our justice system can sometimes be. I would hope that Sir Iain Blair is forced to account for the actions of his men, but in their defence he could say that there is little point in charging George Michael because nothing would happen to him if he went to court. Absolutely correct Paul Johnston. The police are paid to enforce the law, not to interpret it, they are neither qualified nor elected for that role. Lack of firm government, even clear guidance allows the migration of authority from those who should to those who should not be exercising it. If the law is unclear it should be clarified and this is most definitely for Parliament,(or in some cases now apparently Muslim courts, where did that slip in from so quietly I wonder), I hope this sort of thing will become a manifesto issue, Hear that Cameron. Are there actually 'young people who admire George Michael'? I'd be surprised if anyone under the age of about 40 had a very clear idea who he was at all. What % of cocaine users steal to feed their drug purchase? Has IDS done a Freedom of Information Act request to find our what proportion of people with class A and class B drugs on them were released without charge? If not he simply has no idea what he is talking about. The reason George Michael (released without charge) is reported on and Joe Bloggs (released without charge) is not should be blindingly obvious. I challenge the Editor to make such a request, if IDS won't. 1. The police could not arrest Winehouse because there was no evidence that she was actually sniffing coke. She could have been sniffing washing powder. Our laws are, thank goodness, based on evidence. There was no hard evidence in that case, that's why people like Ian Blair were blasted for not understanding British law. 2. I wonder if IDS (a man I much admire these days) realises how common cocaine use is in urban areas, especially amongst middle-class people? Essentially, coke is the new cannabis. Do we really want to waste police time chasing after professionals (including many doctors and, dare I say it, Tory officials!) who indulge in a bit of 'white stuff' in between dinner courses? It's time we legalised and taxed certain drugs. Most things are harmless - in moderation. Anyone care to disagree? Justin I do have a certain sympathy for what you're saying and it would perhaps be one answer to legalise across the board. I am not entirely against that idea and it is very true that it would tackle the problem I have which is that at present "celebrities" are being treated differently from ordinary Joe Public! Well said, IDS. How can anyone seriously expect the public to respect the law when celebrities feel little or no consequences for their criminal behaviour? What an embarrassment to law enforcement. Do we really want to waste police time chasing after professionals (including many doctors and, dare I say it, Tory officials!) who indulge in a bit of 'white stuff' in between dinner courses? You are right - let's not arrest the middle classes for drug offences. Perish the thought that we ruin a dinner party when we could be arresting council house tenants whilst eating their bargain buckets. This almost enough to make me a agree with IDS.
" I wonder if IDS (a man I much admire these days) realises how common cocaine use is in urban areas, especially amongst middle-class people? Essentially, coke is the new cannabis." You mix in strange circles, Mr Hinchcliffe. Both my children are middle class professionals living in, or recently living in, London and one is a doctor. Neither indulges in illegal substances. Do these cocaine consuming “professionals" who never think about the trail of blood that brought their cocaine to their font doors? No we should not legalise cocaine because of the terrible damage it would do to the young and the inadequate. Furthermore, the police should enforce the law as it is with no get out of jail free card for either “has been” celebrities or "Tory officials." "Do we really want to waste police time chasing after professionals (including many doctors and, dare I say it, Tory officials!) who indulge in a bit of 'white stuff' in between dinner courses?" Yes. It's illegal and those "professionals" are providing financial support to the criminal fraternity. "Both my children are middle class professionals living in, or recently living in, London and one is a doctor. Neither indulges in illegal substances." David_at_Home I don't want to worry you unduly but do you know 100% of what your children do? 100% of the time? A survey was conducted a while back and traces of cocaine were found in the toilets of the most surprising places - including Buckingham Palace and the House of Commons. I am not being an apologist for drug use but it goes on all around us. My argument on this thread is simply that there should not be one law for celebrities and one law for the rest of the population. Blimey, I find myself in agreement with Passing Leftie. People who use cocaine etc should be arrested whether they are fine,upstanding bright official Tories or unclean, slovenly, benefit scrounging,beardy weirdy members of the Liberal or Labour party! On a more serious note the fact that drug use is prevalent amongst some middle class people Justin is absolutely the last reason why it should be legalised.Whilst some people can use drugs without it destroying their life many cannot and the effects are disastrous both for them as individuals and our society. Sally, you beat me to it. Yes, David, how do you know? Do you honestly think they'd tell you? "traces of cocaine were found in the toilets of the most surprising places - including Buckingham Palace and the House of Commons." Sorry, Sally, but I don't find this at all surprising. It is part of the problem. While I of course admire IDS's determination that every sometime alleged coke-user in the public eye should be felt up by the Filth, I *still* don't think that this is going to be his cunning way back to the leadership. Malcolm, I didn't say that drugs should be legalised for one particular class. I was just pointing out that cannabis is the new coke (one for Private Eye?!) and that is so widespread, across all social classes, that the police would be on a hiding to nothing if they enforced existing laws. "Whilst some people can use drugs without it destroying their life many cannot and the effects are disastrous both for them as individuals and our society." Granted, Malcolm, and to a certain extent I'm playing Devil's Advocate here - but there are also people who cannot handle a pint of beer, a glass of wine or a bar of chocolate - or indeed a visit to the casino or racecourse! Are we going to ban all those too? You are sounding very authoritarian despite being a member of a party (UKIP) that claims to be libertarian. If the majority of users of a substance do so without ever committing crime, then should that substance be illegal? Clearly if a substance should be banned because it creates a minority of addicts,then the argument for banning alcohol is as strong as that for other drugs like cocaine. Just as you attack the Met for uneven application of the law, are you not equally guilty of uneven banning of substances? So you agree it should be legalised to stop that? I do not follow these so-called celebrities but I do seem to remember that George Michael has, on more than one occasion,been found driving or crashing a car whilst under the influence of drugs. That is a severe hazard to the public. If the reason for leniency is a lack of prison places then perhaps he could do a period of community service. There are jobs to be done like cleaning the toilets on Hampstead Heath but perhaps that might not be a punishment at all. Prohibition did not work and increased criminality. The War on Drugs in the US has failed abysmally. Drug prohibition has not worked here either. I am not advocate of drug use and have never used drugs myself. However, I have been appalled by the authoritarian opinions that have been expressed on this site over the last two days. I am an advocate of individual rights and self-ownership. That means that an individual owns his his or her body and has the right to take whatever substances he or she wishes. The alternative is slavery - the state owns owns you body and what you do with it. That concept is abhorrent to many conservatives, not least because of its implications for morality and taxation (collective theft initiated through the ballot box). I voted for David Cameron in the leadership because I thought that he would take the party in a truly liberal directiuon, i.e. increase social and economic freedom. Cameron has proved to be a social democrat on taxation, untrustworthy on the EU and an authoritarian on personal lifestyle choices. I am not surprised that the authoritarian is IDS is comfortable with Cameroon conservatism. My local Conservatives are campaigning against even small housing development. They are the worst sort of Nimbys who have no creativity or vision. No libertarian can support it - inside the Conservative Party as an activist or donor - or even voting for it. I let my membership lapse after it was clear that Cameron's liberal conservatism was a fraud. It was the most principled decision that I have ever made. If you believe in freedom, the Conservative is not for you. As I think you will know, being a parent, even of adult children, means that there is always a dull fear at the back of your mind about what they may do next and I am sure that both our grown up children sometimes behave in a way that Mrs_at_Home and I would not approve but they both have strong views against dugs. Justin Hinchcliffe's comments seemed to typify the views of a certain sort of Tory (and I would not accuse you being such) which is that the purpose of government is to accommodate the convenience of the well of "professional classes" without regard to the consequences for the "Chavs" (their description, not mine) who live down the road on the estate. It is almost enough to get me to agree with our friend Passing Leftie. David_at_Home I am delighted that your children do avoid drugs and I hope they continue to be a credit to both you and Mrs_at_Home! I think however that neither Justin nor I would disparage those from a different background as mere "chavs" who deserve different treatment from the middle classes and indeed what I have sought to argue from the outset is that everyone must be treated equally before the law! "I am an advocate of individual rights and self-ownership. That means that an individual owns his his or her body and has the right to take whatever substances he or she wishes. The alternative is slavery - the state owns owns you body and what you do with it. That concept is abhorrent to many conservatives, not least because of its implications for morality and taxation (collective theft initiated through the ballot box)." And to clarify - this is the paragraph we agree on Libertarian - the rest of your comments about the Conservatives I disown! Speeding, talking into mobile 'phones whilst driving, shoplifting etc are also prevalent across all social classes too and sadly are all too common. The police should enforce the law against drug use just as they do against these offences. Your point Sally is a good one to which there is not a glib answer in debate. Practically though the sheer scale of drug use as a direct cause of crime leads me to believe that it should be illegal and every effort made to punish those who promote or indulge themselves in drugs. "Practically though the sheer scale of drug use as a direct cause of crime leads me to believe that it should be illegal and every effort made to punish those who promote or indulge themselves in drugs. " But the trouble is, Malcolm - we are losing the war on this one! I look forward to perhaps continuing the discussion in person in Brum perhaps whilst consuming a chilled glass of a legal substance? Mara MacSeoinin writes: "...it is an incontrovertible fact that drugs such as heroin and crack cocaine have a far-reaching effect not only on the individual who is addicted to them, but on society itself..."
Not true, Mara. Heroin & crack cocaine addiction is a sympton not a cause. After all, why aren't you & I heroin addicts? It's not because they're illegal; it's because the thought of taking these drugs doesn't cross our minds: we've got our lives to get on with! "Practically though the sheer scale of [alcohol] use as a direct cause of crime leads me to believe that it should be illegal and every effort made to punish those who promote or indulge themselves in [alcohol]"
Do you support the banning of alcohol Malcolm as I am sure you agree the above statement is equally true? Well, that's hit the nail on the head, hasn't it? You want to be able to have your poison of choice but 'enslave' others who want theirs, introducing and leading them into a life of crime? If we're all honest, there are big differences between middle-class professionals who use it around their NW3 dinner tables and chavs. Let's not kid ourselves. Professionals, eg a doctor, will use it responsibly and go to work the next day and treat people. The drug-taking chavs put people there. I know it’s a sweeping statement but mostly true. Should they be 'punished' equally? No. We should leave it to the courts to judge individually, case by case. "What is UKIP's policy on drugs? Is Europe to blame? LOL"
Section 4.4 does not indicate that UKIP would take a soft line on drugs. Have you a defence of your totally absurd comment, Mr Hinchcliffe, which seemed to betray your feeling that the law of the land should not be applied to celebrities, “professionals” and Tory Party officials? What happened to UKIP's Freedom2Choose, d_a_h? If you base banning of a substance of the creation of addicts and crime, then surely UKIP should be leading the fight to ban alcohol? Warn people about the health consequences of taking them, and watch the vast crime aspects of drug supply disappear over-night. Him or her, please Sally, him or her! I'm in favour of making drugs available on prescription on the NHS to addicts. This worked for years with heroine before it was criminalised. The low-level crimes induced by addiction such as burglary and prostitution would be reduced, and it would damage the market for such drugs. "If we're all honest, there are big differences between middle-class professionals who use it around their NW3 dinner tables and chavs. Let's not kid ourselves. Professionals, eg a doctor, will use it responsibly and go to work the next day and treat people. The drug-taking chavs put people there." I cannot believe I am reading this! It is almost enough to turn me into a socialist! The problem is, as IDS points out, we are not putting enough effort into the fight. Police turn a blind eye to celebrity drug-taking - as if it's OK if you're rich and famous. That serves as propaganda for the "enemy". Too few good rehab facilities - ie little attempt to win people over to "our side". Our prisons allow the "enemy" access to convert the vulnerable. There are many steps which could, and should, be taken - this govt simply isn't trying. IDS only needs to put his name to anything... to remind me why he should have been thrown overboard after his comedy leadership. Tories repeatedly vaunt the most ludicrous rhetoric on drugs. Until they've thought it through - the argument should be put in the same freezer as the Europe debate. Stunning isn't it - straight out of a Bremner, Bird and Fortune sketch! If you want to change UKIP's policy on drugs, GB£, you will have to contact Nigel Farage. The views I express here are mine alone and I am concerned with the protection of the young and vulnerable. Alcohol is deeply imbedded in our society and can easily be made from fruit juice so it is just not practicable to ban it completely. Nevertheless, increased alcohol use in recent decades has been deeply damaging to the young and I would very much favour controlling its availability far more strictly, together with the removal of licences from those outlets which transgress. Ditto tobacco but even more so. The fact that alcohol can be damaging is not a reason for decriminalising other dangerous substances any more that the fact that cars kill people would be an agreement for the unrestricted ownership of lethal firearms. Do we really want a significant proportion of our young people to become druggies before they have even properly grown up? As for the "War on Drugs", as this George Michael incident indicates, it is a phoney war. The police should try much harder. Taking passing-lefties comment on what proportion of Class A or B drug holders were released with charge a bit further. George Michael was cautioned, was it a simple or conditional caution? A caution creates a criminal record, that as I understand it, is never spent. This apparently is due to an oversight in the drafting of the legislation for cautions rather than any vindictiveness. So in a funny way a caution can be worse than a conviction, especially if the conviction is a suspended sentence or a fine. A caution also, I understand, carries the same weight as a conviction in Police targets and so much more quickly than all that tiresome attendance at Court. "Cautions are not covered by the Rehabilitation of Offenders Act 1974 so will never become spent." Me too David at home! Clearly you've not learned much from your 'fishing in the Thames' speech Justin. Yes Sally we are losing this war. The reasons are, as Tim states, it's not being fought well at all. Sadly, I won't be in Birmingham but another time perhaps? Crown prosecutors have said Sir Ian Blair has misunderstood the law in making a call for celebrities caught on film taking drugs to stand trial. The Metropolitan Police Commissioner had called for a change in policy by the Crown Prosecution Service (CPS). He cited the case of model Kate Moss, who was not prosecuted as police were unable to prove what substance she had allegedly been filmed using. The CPS said it pressed charges when offered sufficient police evidence. Sir Ian supported an investigation into the claims against Kate Moss, citing the possible impact of such behaviour on "impressionable young people". But she escaped prosecution because police were unable to prove what substance she was allegedly using in a west London recording studio. "I was quite clear that I expressed my concern over the Kate Moss story, and we did that same investigation and we hit the same issue," Sir Ian said. But the Director of Public Prosecutions Sir Ken Macdonald QC, said: "If he is accurately quoted he appears to have completely misunderstood the law. "The issue was not whether the white powder that Kate Moss was snorting was cocaine or talcum powder. "The law required us to prove that it was either a class A drug or a class B drug. We could only base our case on one of these options. "It was impossible for us to do this since cocaine - a class A drug - and amphetamine - a class B drug are both white powders." He added: "Any suggestion that the CPS does not prosecute celebrities is completely untrue. "We will prosecute when the police provide us with sufficient evidence to do so." One of the under reported outrages of the last 11 years has been the proliferation of the 'Useless Police'. They have become a politically correct rag bag army, now mainly staffed by thick, qulaification-less wooden tops ['just doing my job, guv'], plus quotas from every minority Labour needs to pander to, and led by an Officer Class epitomised by Brian Paddick, Ali Dezai and "Sir" Ian Blair, chancers one- and- all. All the police are fit for in this country is harrassing motorists [in order to meet targets], and taking the DNA from fathers who want to see their own children. Vote Labour- and get the police force you deserve. ..but back in the real world (for the benefit of David_at-Home, Malcolm etc), millions of Britons, young and not-so-young have been using recreational drugs for a very long time without the vast majority becoming addicts or being dragged into a life of crime. Drug usage is no less embedded in every day life than alcohol consumption. Young people who want to take drugs, will take drugs. Access to them is really not difficult at all but it hasn't turned the majority of users in addicts in the past, so why should it in the future? The way to protect the young is to ensure they are taking what they think they are taking, and that means dragging drug usage out of the shadows and control of shady dealers, not pretending that it is some minority activity that can be stopped. It seems to me that IDS is piggybacking his hobbyhorse on a high profile arrest. London forces prosecute only 50% of all drug seizures and only 5% result in anything worse than a fine. Without knowing the quantities involved, I suspect George Michael was treated just the same as anybody else would have been. And by the way, if The Sun was genuinely worried about what this says to our youngsters, it wouldn’t be passing the message along. "Drug usage is no less embedded in every day life than alcohol consumption." Nonsense. Don't extrapolate from your own experience. For every home that has no alcohol I'll find you a thousand that have no Class A drugs. "Whatever you do in the privacy of you own home is entirely your own business providing it does not affect anyone else"
Take your drugs at home (out of sight - out of mind) to your heart's content but as soon as you do it outside in a public place then expect to be prosecuted for it. As for the addicts who steal to fund their habits there is always the other Islamic answer - on the third offence chop their hand off. If habitual theives will not stop on their own then the authorities take effective steps to make them stop without overcrowding jails. The reality for most people is that they have no involvement at all with the consumption of illegal drugs. Furthermore, as their children are growing up, they fight tooth and nail to keep these things away. Legalisation would make this task a thousand times more difficult. Politicians of all parties know this which is why no party has the legalisation of drugs as a stated aim even if some have a policy of underhand legalisation by indolence. What's the difference between illegal and legal drugs? Only the legality. So when discussing whether certain drugs should be banned/unbanned you can't really use their current legal status given that's what is in question. So the question is, do a large amount of households have involvement with drugs of any kind, be they legal, perscription or illegal - which I'd say they do. According to Norm, the number of homes that contain butter knives is a crucial question when legislating against knife crime. Don't let the facts get in the way of your rant. According to the European Monitoring Centre for Drugs and Drug Addiction, 13% of 16-29 year olds who visit pubs and bars have tried cocaine. Remember, that stat is for cocaine alone, not including other recreational drugs. In fact 5% of the whole UK population has tried it according to the same report.That works out as a few million Brits. Across the whole EU, cocaine usage increased by almost a third last year compared to 2006. You are going to need a whole load of prisons (a 3800% increase on current total capacity) to lock up all those people, and just consider the cost to the nation of losing the taxes these people earn. Well exactly.. you can't ban all knifes just because you deem knife crime to be a problem as they are used by so many without a problem. You can legislate to stop people carrying them about in the street. The same as you shouldn't ban all(or rather arbitrary some) drugs but can arrest for being drunk and disorderly. "In fact 5% of the whole UK population has tried it according to the same report.That works out as a few million Brits." And the sample size for this statistical revelation was....? "So the question is, do a large amount of households have involvement with drugs of any kind, be they legal, perscription or illegal - which I'd say they do." So the half empty bottle of paracetamol we have in our first aid box justifies others keeping cocaine in the kitchen, does it? You might just as well write that, since a large number of households have access to money, this puts them in the same category as the very small number off households which have access to stolen money. The difference is the Law of the Land and the great majority of us ARE law abiding. If you want to change the law of the land then you will have to go through Parliament (or at least until Brussels gets its claws onto yet another part of our democracy). To change the law you will have to convince the general population, and through them the MPs, that the recreational drugs which are currently illegal will not, if legalised, become a greater threat to their children than is presently the case. Currently there is no prospect whatsoever of this so the law will not changed. If the law is unchanged it should be properly enforced. 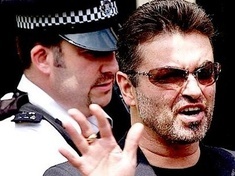 If the law were properly enforced then George Michael would be in clink along with many of Justin Hichcliffe’s dining circle (“professionals” and Tory Party Officials, or so we are told). The prospect of this does not cause me too much distress! I was going to just blog:- No wonder so many young people and indeed, supposed adults as well, crave so desperately to be FAYMOUS!! They see the members of the A,B,C,D,E,....Z, lists getting away with the various things mentioned on this thread, so WHY NOT indeed should they NOT wnat to join in???? I have seen the capitalised word (my capitals) RIGHT, used before on this website, and it really gets up my.....!!!!! They DO NOT have a RIGHT, they CHOOSE to so do, which is NOT the same thing!! There is NO unwritten law somewhere in the sky, which states that whatever a person chooses to do is their RIGHT. Unfortunately it IS usually selfish people who usually come up with phrases like that!!! Or people like 'libertarian' who perhaps prefer a free and easy attitude to the English language - until one day when perhaps their liberty, or some financial advantage is at stake!!! was basically that paracetamol in my cupboard would legitimise cocaine in yours. "And the sample size for this statistical revelation was....?" "In fact 5% of the whole UK population has tried it "
They would be less inclined to try it if there were realistic penalties in place for possession and some high profile examples were made, starting perhaps with George Michael, Kate Moss and some of Justin Hichcliffe’s pals. Trying is not the same as regularly indulging. Now late middle age, I “tried” smoking a pipe once when I was about 17. I was violently sick in the most humiliating of circumstances and tobacco has not been near my lips since that day. GB£, people who believe they are above the addictive power of cocaine are on very, very thin ice. If cocaine usage really is up by a third then we are sleepwalking into a monumental health crisis. You're completely missing the point d_a_h. If millions of people are taking a substance, and the vast majority of them do so without descending into crime, then what benefit is there to the state at all in making it illegal? Sure, if we introduce capital punishment for people who drive (because there are 1,000's of death per year from dangerous drivers) the number of drivers would fall. but when the vast majority drive safefully, clearly the problem is the few dangerous drivers, not driving in itself. "If cocaine usage really is up by a third then we are sleepwalking into a monumental health crisis"
Not if we ditch the NHS approach, introduce social insurance and thus make drug users pay an increased premium for their lifestyle choices. I quite agree, Patsy Sergeant. The idea that one can do as one might wish without any consequences for the remainder of us is self evidently incorrect. For example, the consequences of martial infidelity ripple though our society, touching many, far and wide. "Not if we ditch the NHS approach, introduce social insurance and thus make drug users pay an increased premium for their lifestyle choices." And if they could no pay, GB£, you would have us leave them to die in the street, would you? Get real! No-one is going to vote for this, not even you if you thought through the consequences. And if they could no pay, GB£, you would have us leave them to die in the street, would you?" Read the reports! Cocaine is mostly used amongst wealthier users. And before you say 'get real', I believe it was your party leader who suggested social insurance. Are you really a ukipper? I thought that was the basis of our legal system in that we all have the right to do what we want, unless illegal or causing harm to others, as opposed to the EU system that has to have a specific written right for everything? Yes, people don't currently have the right to take certain drugs but I would say Libertarian was suggesting how he/she thinks should be, not how it is. Why would legalising drugs cause people to blare music, and this suddenly not be classed as causing grief to others and so acceptable? Surely you would use the law as a guide to how you should go about your daily life, (taking into account the consequences of being caught/punished etc) rather than define your morals to the letter of the law?.. or do you think Government knows best? Isn't that the same as religious types that follow the letter of their chosen book even if mistranslated. Like I've said today at some point I agree that it probably wouldn't change as there are too many interested parties for keeping the status quo, and so if you are deciding what current conservative policy should be then current legal status may have to be considered. If we are discussing what should happen, if there was a strong enough will to implement it, then current legal status is irrelevant and the fact that most people are law abiding is also irrelevant as if they were legalised, even more people would be law abiding. Instead they are made to feel like criminals and if they define their morality by the law they think they are going to hell anyway- so they might as well break more rules, hence the downfall of society. Only through giving people all the facts and letting them make their own choices can any progression be made - otherwise you might as well vote for the United states of europe who will happily make all your choices for you - They know what's best... for them! "Read the reports! Cocaine is mostly used amongst wealthier users." Oh, I see. You would let only the vulgar heroin users die in the street! "Are you really a ukipper?" UKIP’s colour is magenta which you get by mixing blue and red. "Oh, I see. You would let only the vulgar heroin users die in the street!" Where are you heading with this one d_a_h? I am discussing cocaine, no other drug. I do not propose treating all drugs the same, as clearly they are not, and am not proposing a blanket legalisation of all drugs, just the one our current Mayor has bravely admitted to have used. What I am saying is if one drug is widely used and the majority of its users are able to live otherwise regular lives, what benefit is there is making it illegal when it could be decriminalised and thus enable the government to focus its fight on those drugs where the majority of its users do end up as addicts, resort to crime to feed their addiction etc. Surely treating all drugs the same, as you propose, actually makes success in combatting the 'bad' ones less likely? Ecstasy, LSD, heroin, cocaine, crack, magic mushrooms, amphetamines (if prepared for injection). These penalties already exist. They don't seem to act as a deterrent. An issue: As cautions are supposed to be for minor offences, and the possible sentence for George Michael was 7 years (especially in view of repeat nature), has there been an abuse of the caution framework? ie Are cautions being used in unintended ways? If anybody wishes to argue that the law considers any activity that carries a 7 years sentence as a minor infringement, I would be interested to see that argument. To me minor is 6 mths max. I am still in favour of decriminilisng but also strongly in favour of much stronger ecucation and rehab programmes. You wrote "Not if we ditch the NHS approach, introduce social insurance and thus make drug users pay an increased premium for their lifestyle choices." Nothing there about free treatment for "lower class" heroin users but expecting the more "professional" cocaine users like Justin's pals to pay their way themselves. Anyway, what about the poorer cocaine users? Are they to be left to die the street? There is not a shred of logic in your ideas. I think you need to return to the drawing board. Well if they are legal and taxed then this money can go to the treatment, just like with alcohol and tobacco - no need to charge at the hospital then and so no need to leave them on the street to die as they can't afford to pay for treatment of their illegal and hence untaxed actions. I read/heard recently that cocaine was now so cheap that its use has deeply diffused across all social groups. I find the views of those who think class a drugs should be freely available deeply worrying. As for punishment and enforcement, since when was it for the police to pick and choose: they don't do that with for example speeding and quite rightly so. "Whilst I certainly believe that privacy and the right to freedom of choice is - or should be - a donné - possession of substances that have a direct link to crime should not be condoned. 75% of heroin/crack users say that they steal to feed their habit, many female addicts turn to prostitution, family relationships often suffer irreparable harm, and the cost of drug crimes/addictions to the taxpayer is astronomical "
Circular logic?! They steal to feed their habit because prices are inflated by their illegality. "The idea that one can do as one might wish without any consequences for the remainder of us is self evidently incorrect. For example, the consequences of martial infidelity ripple though our society, touching many, far and wide." Of course marital infidelity (I assume that's what you meant, not soldiers defecting to other armies :P) is often damaging. What's your point? Are you advocating that we make adultery illegal? Not everything that is wrong should be banned, you surely agree with that? I'm afraid drugs are everywhere. I speak as a young person myself. I have never taken drugs - not even tobacco - but you cannot avoid them. Everyone knows somebody who takes drugs; every school has a large minority who are regular users; every large party has a room or two filled with the stench of marijuana. It cannot be defeated by spending ever more amounts of money on futile (and often disinterested) policing. If anything, the danger factor we add to drugs through their illegality only strengthens their appeal. We must get real. I wonder how interesting cocaine would be to the chattering classes if it was legalised? They'd probably just move onto another illegal substance instead. Inevitably this post brought out the 'legalise illegal drugs' comments. But it’s not a question of whether taxes can be obtained, or whether criminality to feed illegal drug use can be eliminated by legalising, but the effects of mis-using addictive drugs. The fact is, while criminalisation doesn’t eliminate drug abuse, if you legalise something, it make that thing easier to do, thereby increase the occurrence of it (e.g. as with abortion). Not a good idea if, as is often reliably claimed, illegal drugs can cause emotional and mental illness and resulting suffering to the 'users' and their families. IDS was absolutely right to speak out, and has shown himself once again to be a man of principle speaking for the interests of the vulnerable, but admittedly not likely to please the me-centred-do-as-I-want-never-mind-the-consequences liberals. The question is do we want less drug mis-use and the suffering it causes? IDS says, The Centre for Social Justice's Breakthrough Britain report showed that in Holland and Sweden where they have much clearer and tougher laws, everyone gets treated the same and the result is that there are no mixed messages and they have proportionately far fewer drug abusers than the UK..
IDS is absolutely right to raise this matter. The Police should definitely have taken action to charge GM. There cannot be one law for the rich and famous and another law for everybody else. Banned substances are banned for good reason - the use of illegal drugs is disastrous both for the user and for wider society. The Party shouldn't be seen to support or sympathise with law breakers. "Professionals, eg a doctor, will use it responsibly and go to work the next day and treat people." Justin, unlike I suspect either you or most people commenting on here, as a prosecutor, I've actually been around crack cocaine. Unlike powder, there is just simply no such thing as a casual or social user of crack. "If millions of people are taking a substance, and the vast majority of them do so without descending into crime, then what benefit is there to the state at all in making it illegal?" This is not really the point. The point is that as long as one assumes the current law remains what it is, the police should be enforcing it even-handedly, whether one agrees with the policy behind the law or not. Well, that is the point. If they were to enforce every law without using their judgement, apart from being bad policing, there would be just too many people to prosecute. Legalising illegal drugs can mean that people will take less, or either move on to one that's better for them, be it because they could only get superstrength or harder ones before, or that they were getting obscure legal immitations of illegal drugs so they could remain law abiding. Which means the police can enforce properly any laws to deal with any problems that do arise from either taking or misselling etc. But these things aren't going to please the me-centred-I-don't-do-it-so-you-shouldn't-never-mind-the-consequences authoritarians.